For many Olympic athletes, competing at tip-top shape involves not only years of intense practice and training, but also years of adhering to an extremely healthy diet. So, it should come as no surprise that when some Olympians are finished competing at the Games, they reward themselves with as much fried, greasy, and fatty junk food as they can possibly eat. At least, that's what Australian badminton player Sawan Serasinghe appears to have done after losing to Chinese Taipei on Saturday, according to a report by Mashable. 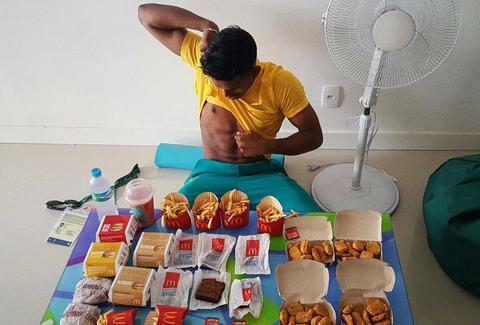 After the match, Serasinghe posted a photo of himself with an enormous feast of McDonald's -- what appears to be four 10-piece McNuggets, two McChickens, a Big Mac, a Quarter Pounder, two hamburgers, six orders of fries, and six brownies. Also, a few packets of sauce and a drink. It's probably more McDonald's than you eat in a whole year. Someone should call Matt Stonie. "Just want to say thanks again to everyone back home for the on going support," he said. "Definitely motivated me to fight hard on court everyday! Now it's time to eat some junk food after months of eating clean!" As the Mashable report suggests, Serasinghe is far from the only Olympic athlete that will seemingly contend for a medal in fast-food binging in Rio. Makes sense, considering the actual Olympic venues are apparently running out of food. Tony Merevick is Cities News Editor at Thrillist and probably doesn't eat that much fast food in a whole year. Send news tips to news@thrillist.com and follow him on Twitter @tonymerevick.